KPI Online provides you with instant access to the data you need to run your business and make smart decisions while eliminating the time wasted creating reports or managing spreadsheets. We have packaged a powerful analytics software as an online service for small business that easily plugs their accounting or ERP system and all its data into a dashboard creation engine. These dashboards can be used to compare, measure and dive into the details of the information that matters to you. Why should I subscribe to KPI Online? How do I sign up for KPI Online? Sign-up for the 7-day free trial, export your data, upload it to our data center, and start viewing your data in visually appealing management dashboards! After our 7-day free trial you can become a subscriber for a no-contract, low monthly fee. There is no risk involved. You can cancel at any time, although we believe you’ll be with us for a long time. Who’s an ideal user of KPI Online? Small and mid-sized companies who run their company with Quickbooks, Microsoft Dynamics, SAP Business One, or other accounting or ERP systems, but find it hard or very time-consuming to create management reports with spreadsheets using data from these systems. Services or consulting companies who have trouble determining if their projects are profitable and if they are allocating resources efficiently. Depending on the level you subscribe to, our subscriptions start at less than $100 per month per user. The more users you have, the lower the average cost per user. You get access to a fully-functioning version of KPI Online, with no limitations in data uploads or functionality. How does KPI Online work? Using our SaaS ETL Engine to connect directly to the most popular accounting or ERP systems to automatically extract your data, or using our spreadsheet templates, you load your data into our secure data center where we encrypt it and populate our reporting engine so you can view your data in several pre-configured visual dashboards that provide you with views into various aspects of your business, such as inventory, sales, expenses, accounts receivable, accounts payable, and more. What ERP or accounting systems do you support? Here’s a list of our connectors that are part of our SaaS ET Engine. How can the KPI Online Community help me? KPI Online is a company that was born in the middle of the Social Media revolution, and as such as we believe in the openness, collaboration and educational content popularized by Social Media. The KPI Online Community is a place where customers, software developers, business consultants and academics can create content, learn from each other, share ideas and establish relationships. It’s also a marketplace where you can buy and sell vertical analytical models to use KPI Online’s powerful analytical engine for your industry. 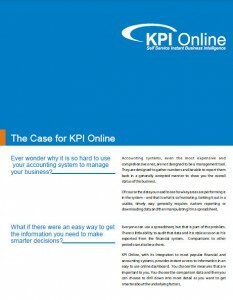 What type of applications are available with a KPI Online Subscription? We are 100% committed to respecting the privacy of the data you upload to our data center for your confidential business use. If for any reason you decide to cancel your agreement with us we will complete erase your data from our servers. Additionally we outsource our data center operations to Amazon Web Services, the most popular hosting provider for the most important software as a service applications. Finally, we adhere to the latest encryption and data security standards in our data upload process. We provide you with a fully automated video training series, and provide live support personnel to help you if you need to talk to a real human. We provide live support via chat and phone, as well as a knowledge base of topics, functional FAQs, videos, and a community forum. How do I become a KPI Online partner? Contact one of our partner managers at 888-820-7776, or email partners@kpionline.com, and sign our partnership agreement. There are no fees to become a partner, just benefits. We also provide you with assistance to help you market to your current installed base or attract new customers. We provide you with help via our online community, with automated training videos, tutorials, blog posts, and a forum to share ideas with others. Finally, you can gain access to a development environment to build connectors to your business software of choice or build vertical solutions for the industry in which you have an expertise. What type of companies make ideal partners? What kind of marketing help do I get as a KPI Online partner?